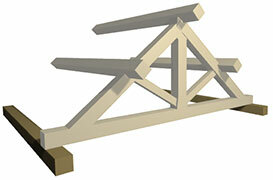 As well as Oak Trusses, we supply the supporting oak timber for your whole job. Below you can order ridge beams, purlins, wall plates and sill plates. The oak in each type of beam is available in two grades, both fresh sawn and suitable for construction. Please note: Our oak beams are imported to order rather than stocked, and therefore have a 2 - 3 week lead time. Oak purlins run horizontally along the length of your roof, resting on, or set into the principal rafters. We offer two grades up to 300 x 300mm. 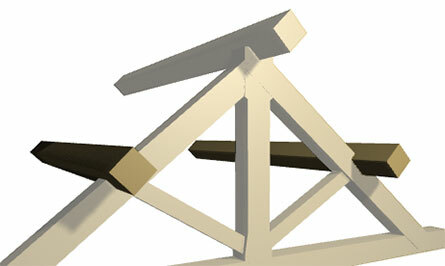 Planing is optional for smoother beams. 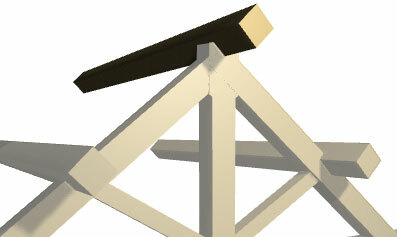 Oak Ridge Beams run along the top of your trusses, supporting the roof. Specify your grade and sizes below. Planing is also available. Depending on your building, oak wall plates are sometimes used running horizontally for your trusses to sit on. If you're building a timber frame, sill plates run horizontally around the base to provide support to your vertical posts. QPA is the cleanest and highest quality beam grade we offer with the strictest quality rules. Beams graded to QPA will NOT have any unsound knots, end, star or ring shake, frost crack, bark pocket, unsound sapwood or rot. QP1 is the second level of beam grading we offer. QP1 beams are still commonly used for structural work. QP1 beams do NOT contain any unsound knots or unsound sapwood, rot, frost crack, ring or star shake. A limited number of pieces may have brown streak or pith.